One of the hallmarks of Blessed Pope John Paul II’s pontificate was his call for a “new evangelization” – a plea to use all forms of communication to spread the Gospel message. 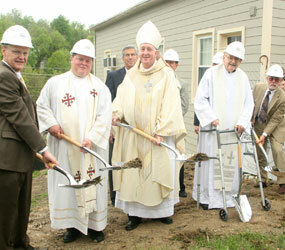 On May 1, the same day the Polish pontiff was beatified, parishioners of St. Paul, Ellicott City, lived out that call in a very tangible way as Bishop Mitchell T. Rozanski broke ground on a $1.73 million New Evangelization Center. The facility will incorporate wireless technology, projection screens and other modern conveniences. It will also feature a “green roof” with gardens and environmentally friendly components. Located high on a hill in a historic section of Howard County, the center will house the 1,100-family faith community’s religious education program, adult Bible study programs, RCIA, Church Leadership Institute courses, as well as other parish and community activities. The added space will open up more room for new activities at the parish, Papania said. St. Paul has already entered into an agreement with Pastoral Counseling Services of Maryland to provide on-campus counseling services, he said. The two-story, 6,000-square-foot center will consist of eight classrooms. The stone-stucco building will complement the existing buildings on the historic campus, Papania said. Penza + Bailey is the architect and J. Vinton Schafer is the construction company for the project. A few months before the groundbreaking, Father Matthew Buening, pastor, said the building’s focus is all about bringing people closer to Christ. “We think the greatest thing about our church is not its history, but its future,” Father Buening said.